Ever felt overwhelmed by choices when it comes to cannabis consumption, thus wishing for a highly specific, practically bespoke option at your fingertips? MedMen’s very own effects-based line, [statemade], just might be the solution to your current state of cannabis confusion: [statemade] offers seven different effects to choose from, whether you want to catch some zzz’s, or get blissed out. This week, we’re getting to know: max. Picture this scenario: You’re meeting friends for a morning hike, followed by back-to-back meetings in the afternoon, but that third cup of coffee just won’t cut it. You need something with a little more oomph; a friendly boost, if you will. MedMen has the perfect solution, and the name is max. This particular [statemade] effect is geared towards energy, so it’s a good choice if you’re anticipating a long day of work or you’re determined to beat your last running time. MedMen’s effects series, [statemade], has something for every mood. 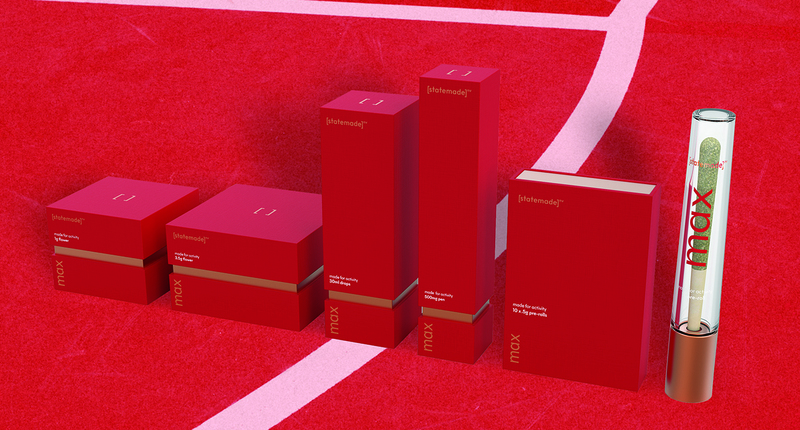 Conquer the day ahead by reaching for max, decked out in sleek red packaging and featuring a delicate citrus and pine fragrance. It contains specially curated terpenes like energizing pinene, and limonene, which supports mental clarity. Drop a max sublingual in your smoothie, or if you want to bring along something to share on that hike, grab a pack of pre-rolls. Whichever route you decide to go, you’ll be happy you let max be the antidote to exhaustion. [statemade] is currently at MedMen marijuana dispensaries in Las Vegas, and will be coming to other locations in 2019.